The latest Scooby-Doo animated feature, Scooby-Doo and the Curse of the 13th Ghost, was a story I never thought we’d see. However, thanks to Warner Bros. animation fans like myself, we’re finally going to get to experience the end of this particular chapter in Scooby-Doo history. Scooby-Doo and the Curse of the 13th Ghost opens with a flashback of Vincent’s previous hunt for the 13 ghosts, which ultimately cost his friend Mortifer his life. When this movie was first announced, I couldn’t help but wonder whether there would be any homages to the original opening, so I was glad to see a title sequence that did just that and caught viewers up on the story so far. After the pomp and circumstance are through, we meet up with the gang solving another mystery. After some good old-fashioned hijinks that left a big smile on my face, they catch the “monster,” only to discover that, for arguably the first time, they caught the wrong person. The sheriff then shows them the real perpetrator and warns them that if they were eighteen years old, the farmer would be able to press charges against them. The next line is the one that really hurts: if the sheriff catches them riding around in the Mystery Machine, they’ll be arrested. What follows is, once again, the seeming disbandment of Mystery Inc., with Fred selling the Mystery Machine, as well as all the memorabilia from their many cases. As the gang laments the end of an era, one of their would-be buyers finds a certain crystal ball. When Shaggy touches it, it suddenly begins glowing, and the visage of Vincent Van Ghoul (now played by Maurice LaMarche) appears, beckoning them to help him fight the final ghost. Since Vincent’s current plight is their fault, Daphne says they have to help, and tells Fred and Velma everything that happened during “the summer that they were away.” As she fills them in, Scooby-Doo and the Curse of the 13th Ghost becomes Daphne’s movie in much the same way Scooby-Doo and the Reluctant Werewolf was Shaggy’s. Over the course of the story, she and Fred very much trade positions on the team, which is an aspect of the film I really loved. Given how she had led the team in the movie’s progenitor, it only makes sense that she would take center stage again. After we are treated to the return of Daphne’s red van and the gang evades a haunted car, they head to Vincent’s summer home, where he fills in the gang on his adventures with Mortifer and his sacrifice. They decide to head Vincent’s air B&B (or as Vincent likes to call it, his air boo and boo), where Shaggy had allegedly mailed it. Once there, the gang runs into Bernie Allen, whose check apparently bounced at the garage sale. As Daphne, Shaggy, Scooby, and Vincent follow him, Fred and Velma go looking for the wayward package. While they watch Allen, the gang runs into the seemingly possessed car, which causes an avalanche. Meanwhile, Fred and Velma unknowingly run into Flim Flam, who takes them to his Realm of Darkness gift shop, which sells chests of demon merchandise, from coolers to phone chargers – oh, and some monster hunting gear too. After evading the haunted car’s second avalanche, the others end up trapped inside the temple. As they look for a way out, they stumble upon the thirteenth ghost, and then we get to see Daphne doing an homage to Indiana Jones while still being in keeping with a classic Scooby-Doo chase. Shaggy and Scooby impersonate monks to try to get the chest from the thirteenth ghost. After some more hijinks, they succeed and head back towards Daphne and Vincent, the latter of whom reveals he’s had wizard block and can’t use magic to get them out. Vincent uses his crystal ball instead, breaking it in the process. How did that work? As Vincent says through his spare crystal ball, “If I showed you how the trick was done, it wouldn’t be magic.” Suddenly, Fred and Velma drop in (literally) after their “encounter” with a ghost. With everybody down in the dumps, Fred boosts them up, culminating in a cheer he learned at, well, cheerleading camp. While I liked this scene, I felt the cheerleading stuff was a little inconsistent with the Fred we’ve come to know. Despite this, the scene does its job putting the team back on track for the climax. Fred and Velma grab Flim Flam (the only one who knew how to work all the bells and whistles on Daphne’s van) and go to meet the others at the temple. After Shaggy and Scooby try to save Vincent, the latter loses the chest trying to save them. 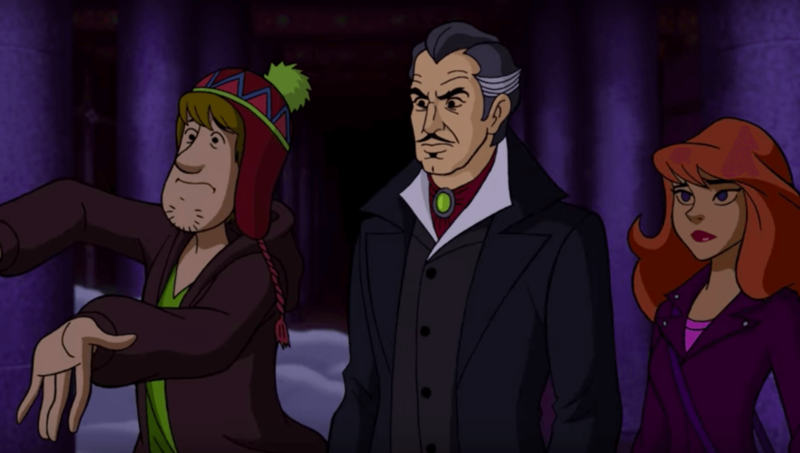 Following a long-awaited reunion with Flim Flam (complete with a reference to good old Scrappy), Scooby-Doo and the Curse of the 13th Ghost gives us something else we’ve been craving: Vincent’s secret connection to the thirteenth ghost, Asmodeus, who is really his ancestor Asamad Van Ghoul. While this is intriguing, there’s just one problem; only the living can open the chest, something the thirteenth ghost was able to do with ease. Of course, this could only mean that the real identity of the thirteenth ghost is Mortifer, who takes off in his haunted car, only to be captured by the undercover Bernie Allen, aka Detective Vance Linklater. Despite this, it turns out Velma the skeptic was right all along, with everybody now knowing the thirteen ghosts were merely illusions, though they are careful to let Vincent keep believing in his ancestor, something that felt off to me. On their way back home, Daphne decides her last act as leader is to “un-retire” Mystery Inc. and continue their monster hunting exploits. Scooby-Doo and the Curse of the 13th Ghost writer Tim Sheridan did an excellent job paying homage to The 13 Ghosts of Scooby-Doo while driving the story towards its ultimate conclusion. I loved Daphne’s arc, and I hope she’ll come to the forefront again in the future. Director Cecilia Aranovich Hamilton does a great job with the animation, giving it a modern feel while still making it in keeping with this film’s progenitor. Scooby-Doo and the Curse of the 13th Ghost is a conclusion over three decades in the making. With Daphne in the lead and long-awaited returns, this film is everything I could’ve hoped for. With any luck, the gang will take turns coming to the forefront in the future. After all, Mystery Inc. is about more than just Scooby-Doo. Scooby-Doo and the Curse of the 13th Ghost is a conclusion over three decades in the making. With Daphne in the lead and long-awaited returns, this film is everything I could’ve hoped for. With any luck, the gang will take turns coming to the forefront in the future.